There's a new graphics engine... the Skylanders can now jump... and there's even a new, fancier Portal of Power, but none of those things are the biggest change in the 2013 edition of Activision's toys-meets-games series. No, the big change in this fall's Skylanders Swap Force video game is that players will be able to take their new real-world Skylanders figures apart, rending upper body from lower, and then combine them with the halves of other Skylanders. In other words, you (or your kids, right?) won't have to play with Wash Buckler or Blast Zone—to name two of the new Swap Force figures. You'll be able to break those guys apart and play with Wash Zone and Blast Buckler. 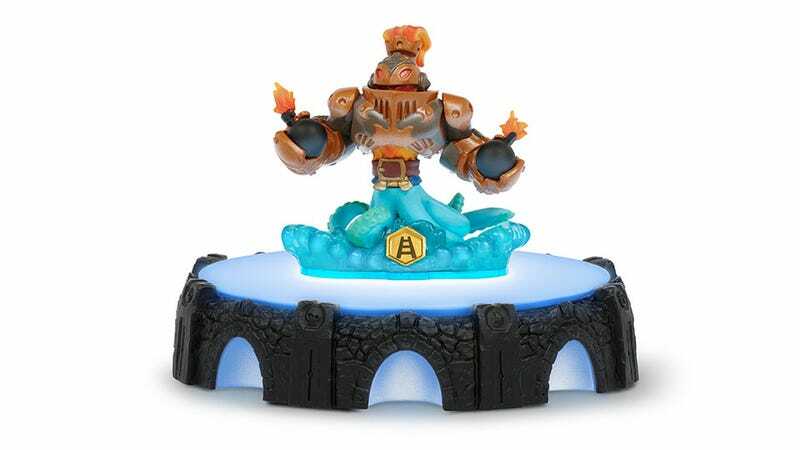 As before, the core idea behind Skylanders is that little toy figures in the real world, when placed on a "portal" connected to a game console, trigger that figure to then appear as a video game character in the Skylanders game. The character gains skills and experience in the game, and that progress is recorded in the toy figure. Older Skylanders figures won't suddenly magically be able to come apart, but the 16 new Swap Force characters can. There will be 16 new Skylanders who work this way, I learned when some reps from Activision and the new game's lead development studio Vicarious Visions showed me the game a couple of weeks ago in New York City. The characters' upper halves of their bodies will define their attack moves; their bottom halves will define movement. Wash Buckler, for example, wields a cutlass and a bubble gun and scampers around on octopus legs that can climb on things. But if he reaches an area where he'd be better off rocketing around, players should detach his octopus legs and attach the lower, rocket half of Blast Zone. The figures come apart and reassemble thanks to a magnet in their waist. Alongside those Swap Force figures will be 16 new "core" Skylanders, 16 returning characters from older games and eight new "LightCore" figures. The starter pack for the new game will include two Swap Force characters and a non-severable core character, plus the new Portal of Power stand/sensor that is needed for the new Swap Force characters. We've got some grown men in the not-so-extended Kotaku family who love collecting Skylanders, and this new batch seems likely to hook them. The reassembly gimmick feels fresh. But Skylanders is getting major competition this fall from Disney's own Skylanders-style project, Infinity. The Activision execs who showed me a little bit of Swap Force declined to say anything about their rivals, offering that they hadn't really seen it yet. (Funny, we had!) We'll see how the competition goes.